brittle, it shatters. The simplest way to prevent this is to install an auxiliary rip fence that closes the gap between the stock fence and table. The auxiliary fence shown at right consists of two pieces: a scrap of 3/4-in. hardwood-veneered MDF cut to the length and width of the existing fence and a 1 V2-in.-wide strip of plastic laminate contact-cemented to the bottom edge of the MDF. The right edge of the laminate that you're cutting rides on the 3/4-in. overhanging strip, so it can't dive below the fence. GUARDS: A blade guard would contain most of the shattered pieces of laminate in such a case. Most guards would also be heavy enough to hold the laminate sheet down flat on the table surface. 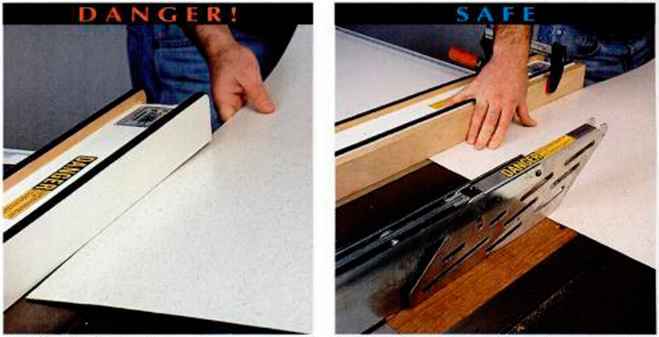 THE FACTS: A 47-year-old professional woodworker was cutting a sheet of plastic laminate on the tablesaw. He was in a hurry and didn't bother to install a zero-clearance auxiliary rip fence to prevent the sheet from sliding under the standard fence. He also had no blade guard. The laminate crept under the fence and "exploded in the saw blade/' throwing razor-sharp fragments that broke a finger and caused severe skin lacerations. A thin plastic laminate sheet can sneak under the rip fence. It can easily bump the side of the blade and shatter. An auxiliary fence closes the gap and prevents laminate sheets from sneaking under the fence. 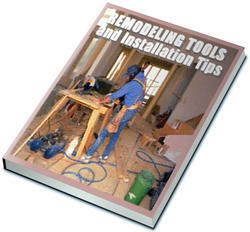 THE FACTS: An amateur woodworker was ripping a long, narrow board with a dull saw blade. The board hit a snag and hesitated. To compensate, he put more weight behind the board and pushed harder with his right hand. The board suddenly zipped through the blade. His hand plunged under the blade guard and into the blade. THE SAFETY LESSON: Some accident victims describe a curious situation where the hand seems to be "pulled into the blade." Two factors contribute to this. The first is a high-pressure feed, and the second is an off-balance stance. When the blade gets past the kink and suddenly cuts through the wood easily, there is no time to react and break your body's forward thrust. Replacing the dull blade with a sharp one would probably have saved the woodworker from serious injury. But even with a sharp blade, it's possible to encounter lumber that cuts unevenly. When this happens, remember to maintain a firm, balanced stance and a continuous feed rate. If the board hesitates, your reaction should depend on your saw's power. If your saw has 2 HP or more, continue feeding the board at the same rate—don't push harder. If your saw has less than 2 HP, stop feeding the board, turn off the saw, and finish the cut on the bandsaw. Don't let the blade guard give you a false sense of security—your hand can slip under it. GUARDS: In this accident, the blade guard made the woodworker overconfident. The guard isn't designed to stop your hand or anything else from sliding into the blade from the front. Excessive teed pressure can make you lose your balance and run your hand or arm into the blade. Knotty or warped boards are especially dangerous; so is a dull blade. In my career as a physician 1 have created many patients with serious woodworking injuries, including amputations. 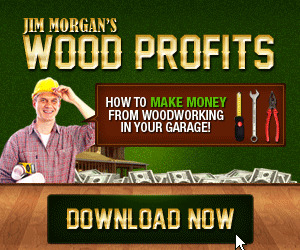 I certainly don't want to discourage anyone Irom working with wood—it's a pastime I enjoy very much myself. But I do want to impress upon you that accidents can happen to veteran woodworkers and beginners alike. Do everything you can to prevent them—but always be ready to react if you should have an accident. The following summary of what to do if you're seriously injured is not comprehensive. In all cases, contact your own healthcare provider for more detailed instructions. • Try to assess how severe the injury is. If you have any doubt, get an assessment from a reliable family member, friend, colleague, or neighbor. • If it's serious, get a ride to the doctor or hospital emergency room—or call an ambulance. Don't take the chance of driving while lightheaded from loss of blood. 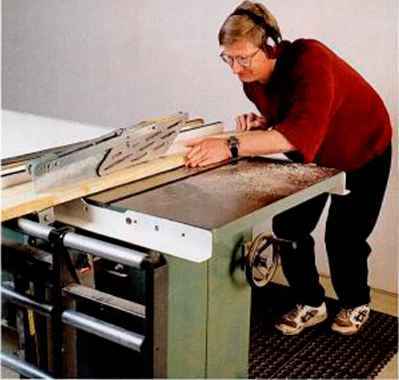 The most serious injuries at the tablesaw involve amputations, lacerations, and eye injuries. Here's what to do in those cases. If the saw blade should cut completely through a finger, hand, or arm, stop the bleeding as well as you can with direct pressure, using a clean rag, paper towel, bandage, or shirt. Get help ii any family members or neighbors are available. Preserve the severed part for possible reattachment. Wrap it in a saline-soaked cloth. (Saline, or physiologic salt water, is available in pharmacies—always keep some on hand.) Place it in a water-tight baggy and take it with you to the hospital in a cool er or other suitable container filled with ice. Do not freeze the part or allow it to be frostbitten. Take all severed body parts with you, even fragments that appear to be too badly damaged for reattachment, because they might be used for grafts. • contain dirt, manure, or fragments of wood, metal, or other foreign substances. To treat minor cuts yourself, clean first with mild soap and water, and then apply a clean bandage. Watch for signs of infection: spreading redness of the skin surrounding the cut, increased local pain, pus, local heat, or fever. If they occur, see your doctor. Because the outer coating of the eye is very sensitive, a speck can feel like a sheet of sandpaper. When a light foreign substance such as sawdust gets in your eye, you can usually flush it out with tap water, saline, or tears. Resist the urge-to rub—you can scratch the delicate cornea, or outer layer. Penetrating fragments, such as splinters or metal .slivers, must be removed from the eye by a physician. I lave ferrous metal fragments removed as soon as possible, because oxidation rapidly produces rust, which leaches out into the tissue around the fragment and may permanently a fleet your vision. Ii a serious penetration should occur, hold the eyelid closed with gentle pressure while getting help. James Follette is a plyysician and part-time woodworker near Albany. NY.